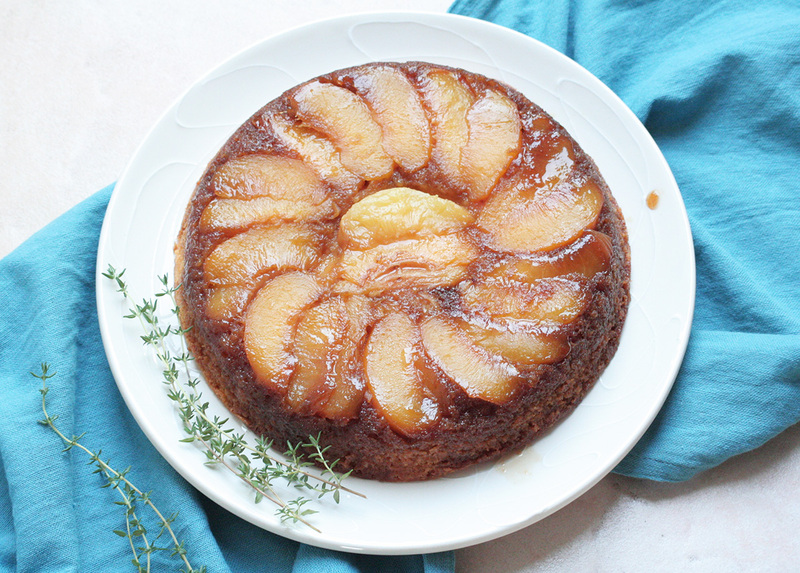 As we say good-bye to summer, I give you this lovely Peach Lemon Thyme Upside Down Cake. Local ripe peaches are still available at farmers markets around New York and New Jersey while fresh herbs such as lemony thyme remain abundant in many of our gardens. Pair these seasonal favorites with buttery cake, and summer may finally feel complete. I haven’t incorporated a Paula Peck recipe into a blog post since springtime (summer has been so busy that I’ve fallen behind on my posts here). I am obviously long overdue and although the idea of this recipe doesn’t come directly from one of her cookbooks, the base of this cake does. I’ve been debating how to use her classic recipe for Melting Tea Cake for sometime now. In “The Art of Fine Baking,” this cake is simply topped with blanched almonds – no glaze, sugar, frosting, or any of the other indulgent cake toppings or fillings that we are accustomed to these days. With a flavor reminiscent of simple poundcake, my grandmother describes it as “half sponge, half pound cake, light but buttery, this cake literally melts in your mouth.” Despite this delightful description, I’m just not sure if such a plain cake would resonate or if most of you would find it boring. Since I couldn’t decide, I figured why not match this basic yellow cake (but oh so much better) with caramelized sugar, one of the best stone fruits, and a lemony fresh herb. I was quite pleased with the results. While regular thyme might be an odd addition to a cake, lemon thyme is just fragrant enough to compliment the peaches. If peaches aren’t you’re forte, this recipe can easily be made with other stone fruit such as plums or nectarines. The cake is really the best part anyway. I am now thinking of other ways (excuses) to use this light flavorful Paula Peck classic Melting Tea Cake recipe. In the meantime, enjoy this peachy way to send off summer. In a 9-inch oven proof or cast iron skillet, heat ¼ cup butter over low heat. Add brown sugar. Heat until sugar is melted. Remove from heat but keep warm. Add vanilla and lemon zest to remaining ½ cup butter and melt in a small saucepan over low heat or in a small bowl in the microwave. Cool and set aside. In a medium bowl, combine eggs, egg yolks, and sugar. Whisk for a minute. Set the bowl over a medium saucepan of simmering water (make sure the bowl doesn’t touch the water). Heat for about 10 minutes, just until the eggs are slightly warmer than lukewarm. Do not let the water boil. Stir the eggs occasionally while they heat to prevent cooking on the bottom of the bowl. When eggs are warm, beat with an electric mixer until they are cool, thick, and tripled in bulk. Sprinkle flour and cornstarch on top. Gently fold in. Fold in butter–lemon zest mixture. Continue to fold until there is almost no trace of butter. Be careful not to over-mix. Arrange peaches in the pan in one layer, allowing slices to overlap (if you do not have a oven proof skillet, the sugar-butter mixture can be poured into a 9-inch cake pan instead). Sprinkle lemon thyme over peaches. Pour cake mixture over peaches and lightly spread until even. Bake in preheated oven 35-40 minutes (slightly longer if using a 9-inch cake pan instead of a skillet) or until puffed and golden. Cool 5 minutes then run a knife around the sides to loosen. Cover the cake with a plate or top of a cake stand and carefully flip the cake over to turn out onto the plate or stand. Serve warm with whipped cream. Note: to peel peaches, make an X on the bottom of the peaches and blanch 1-2 minutes in boiling water. Remove quickly to an ice bath. This loosens skin and allows it to be peeled easily with a paring knife. I don’t see where you use the lemon thyme in the recipe. I like the idea. Thanks for the catch Judy! The lemon thyme is simply sprinkled over the peaches before the cake batter is poured on top. I’ve corrected the recipe. Thanks again! Peaches are totally my forte and we, too, are still getting an excess amount of them (but I also live like 10 miles from a huge peach farm.. so I cheat.) The peach, lemon, thyme combination sounds lovely! And all piled into an upside down cake? YUMMMM! Thanks for sharing and Cheers to a day as fabulous as this cake!